Sadly, Sarah FISH's gravestone is made of sandstone and it becoming lost as pieces shale off it. I took a photo of this gravestone in 2005 and shared it to my tree at Ancestry.com because I am a FISH descendant. Sarah's father Nathan FISH is my 5th great grandfather. Sarah's brother Sands FISH is my ancestor. I was quite excited to see this stone and connect it in my tree with my Gallup and Fish ancestors. I own a copy of the FISH genealogy and it is one of the most interesting ones in my collection. 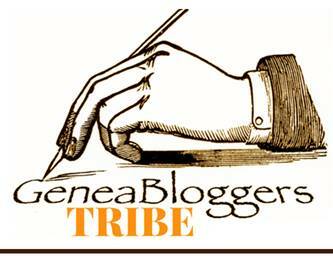 Sarah was born on 1 July 1761 to Nathan FISH and his wife Catherine HELME. 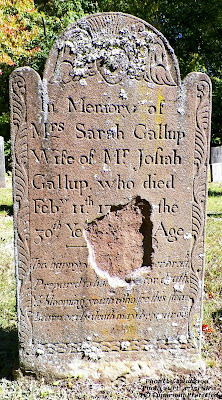 She married Josiah Gallup in November of 1787 and died at age 29 on 11 Feb 1791. Sarah and Josiah had no children together. He married Mary (Polly) Randall the next year and had children with her.